These are big changes, to be sure, but today’s technological progression is also an incredible opportunity for marketers to give their consumers cutting-edge content and strategies tailored to fit their new behavior. Businesses that focus on an incredible customer experience will be able to maintain their competitive advantage. 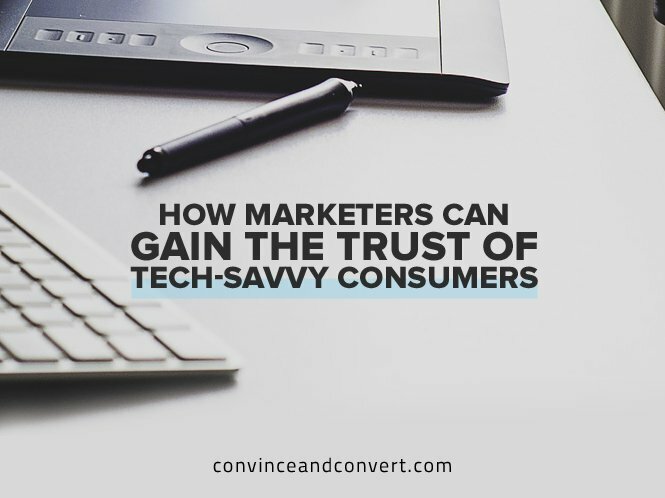 As a content marketer, you need to simplify your approach to consumers in order to stay ahead of these technological advancements. And no matter what data or tactics you use with your consumers, the founding principles of reaching your consumer base must stay consistent. Here are four strategies to remember as you try to reach consumers in a tech-savvy world. Consumers increasingly distrust corporations. The more openly and transparently your brand can approach consumers, the more trust you’ll be able to build. Build your company’s blog around your company’s best practices — especially concerning how you’ll be using the metrics and information you collect from landing pages and other data-capturing means. The clothing company Everlane has differentiated its brand from other e-commerce sites by providing transparent, open communication about its pricing and production process. Its website tells consumers exactly how much it costs to make each shirt. The factories page profiles each workshop or why it selected certain fabrics. It’s compelling storytelling, and it’s contributing to the brand’s growth. You need to offer high-quality content that makes an impact with your customers during each interaction. Use content tailored to your audience, and remember that your conversation is more than just a sales pitch; it’s the start of a relationship between brand and consumer. Who is your consumer, and how can your brand solve her challenges? Inquire about your consumers’ personal stories, and see how your brand fits into them. Look at every single interaction with your leads and consumers, and use the information gleaned from those interactions to determine what value you can bring to them in different forms of content. Consumers aren’t just tech-savvy; they’re also information-savvy. To navigate online distractions, they have built a protective wall around their internet attention. If consumers are going to engage with a brand, they want an experience personalized to them. Amazon does this better than anyone. Technology gives Amazon a treasure trove of data about its consumers—including me. I might get 20 emails a month from Amazon, recommending new books to read or items related to my wish list. I read all these emails because they contain so much rich contextual information. Shopping is no longer a standalone experience; it can be a quick and easy interaction that results from ongoing, personalized engagement. One way to create that context is by using the data you receive from your website visitors. Centralize those data, so you can build a more contextual digital experience throughout the whole communication process. Then, you can tailor your emails and blog posts to the types of visitors you want. The most successful brands actively work to build fewer friction points into their associated technology. The tech-savvy consumer wants a seamless experience, so opening multiple apps and requiring off-site searches and downloads is a sure way to build brand frustration. For example, your leads shouldn’t have to click offsite to find your company’s blog or open too many tabs to find the whitepaper that will work best for them. That’s why apps like WeChat are so attractive. Along with its basic communication features, WeChat lets users order food, pay bills, or find coupons in one integrated app—presenting a huge opportunity for brands to break through the clutter. Instead of just posting a discount code on its Facebook page, Starbucks could use WeChat to direct customers to the nearest coffee shop, provide gift card balances, or send customized promotions based on each customer’s past orders, all without ever leaving this one seamless app. WeChat is extremely popular in China because of this reduced friction. While the app is less widely embraced in the U.S., Facebook is starting to fill the void by integrating more features into Messenger. For example, after chatting with a friend about meeting up for lunch, the app will let you order your ride. My company’s work with Baptist Health used these four principles to build its Good for You wellness community. We used data from Baptist’s website and consumer research to create high-quality blogs and engage users on the site. There, healthcare practitioners can review their patients’ ages, locations, and goals, and match them up with physicians or offer advice tailored to individual needs. It’s a streamlined, contextual experience that solves a complex problem: reaching Baptist’s consumers to build trust, engagement, and value in a technology-driven world. Technology is an influential tool making its mark on new consumer behavior. It may seem daunting to plan a content marketing campaign for your brand around new consumer preferences, but it’s actually a great opportunity to have an impact on each individual lead.